What Does Code P0368 Mean? If a code P0368 accompanies a malfunction indicator lamp (MIL) in your vehicle, it means that the powertrain control module (PCM) has detected a problem with the exhaust camshaft position sensor (or circuit) for engine bank one. Bank 1 represents the bank of the engine that contains the number one cylinder. Sensor B indicates that the malfunction is occurring with the camshaft position sensor circuit that pertains to the exhaust camshaft. The PCM uses input signals from the camshaft sensor/s and the crankshaft sensor to monitor the position and revolutions per minute (RPM) of these vital engine components, manage timing fluctuations, and map fuel delivery strategy. Clearly, variations in engine configuration will dictate the number of camshaft sensors that are required. For instance; an overhead valve engine will typically be equipped with a single camshaft sensor because the engine has only one camshaft. An overhead cam, four-cylinder engine will likely have only one camshaft sensor as well (because it has only one engine bank), but an overhead cam, V6 requires at least two camshaft sensors (one per engine bank). Likewise, a dual overhead cam, V8 engine will require four camshaft sensors because there are two engine banks with two camshafts in each bank. 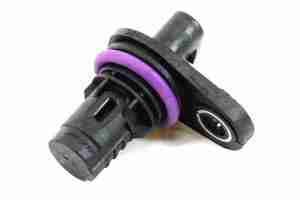 Each camshaft sensor has a circuit (or circuits) dedicated to providing the PCM with individual input signal/s. Camshaft position and camshaft speed are compared to the speed and position of the crankshaft in order to prevent engine damage and calculate ignition timing and fuel delivery strategy. Since the camshaft/s turn at half the speed of the crankshaft, it is critical that the PCM is able to distinguish between engine intake and exhaust stokes (rotations). 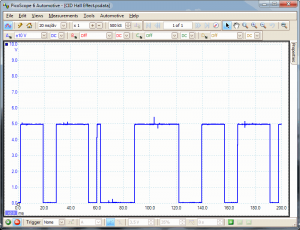 This is also accomplished with the camshaft position sensor. The most common camshaft position sensor design utilizes an electromagnetic hall effect sensor positioned in very close proximity (usually only several thousandths of an inch) from a circuit completing engine ground. In most cases, either a reluctor ring (with precisely machined teeth) is affixed to the camshaft pulley or there are cogs stringently integrated into the camshaft itself. The camshaft position sensor is mounted so that these teeth/cogs pass very closely to its magnetic end. As the camshaft rotates, the raised areas complete an electromagnetic circuit. 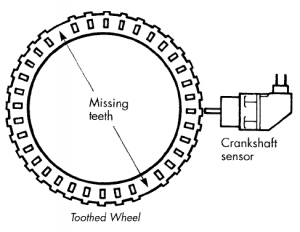 When the indentations (between the teeth pass) pass the camshaft sensor, the circuit is briefly interrupted. Since the camshaft rotates very quickly, the process of repeatedly completing and interrupting the circuit occurs in milliseconds. 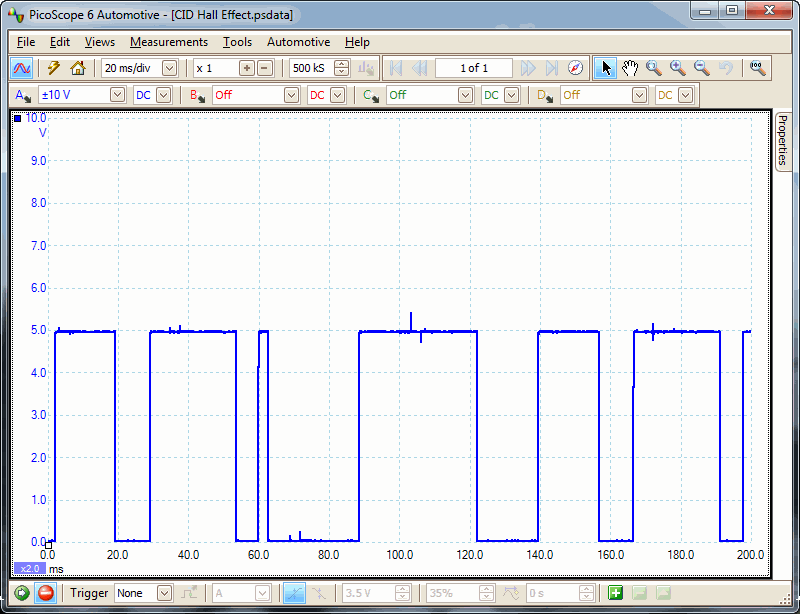 This progression of completing and interrupting the camshaft position sensor circuit produces a waveform pattern. This pattern is recognized by the PCM as camshaft position. All of the camshaft position sensors and the crankshaft sensor function in a similar manner. When the engine is running, the PCM constantly compares input signals from the camshafts and the crankshaft. If the camshaft position is not within a specified degree of variation from the crankshaft and other camshafts, under certain circumstances, for a set period of time, a P0368 code will be stored and a MIL may be illuminated. Typically, when this code is set, the engine will continue to start and run but will fail to perform at an efficient level. What are the common causes of code P0368 ? What are the symptoms of code P0368 ? How do you troubleshoot code P0368 ? Circuit High Input codes are mostly caused by defective alternators that develop excessive voltages, although there may be other causes as well, such as short circuits that “leak” current into a particular system from other, unrelated systems that work on higher voltages. Note that in the case of short circuits that leak power into a control circuit, there is likely to be other, seemingly unrelated trouble codes present along with the code(s) being investigated. Diagnosing a “high input” code will always involve a thorough testing of the charging system as a first step, followed by measures to isolate the system from all other possible sources of power during resistance, continuity, and reference voltage tests. Before attempting to diagnose a code P0368, I would need a suitable diagnostic scanner, a digital volt/ohmmeter (DVOM), possibly an oscilloscope, and access to All Data DIY. I like to perform a visual inspection of all system related wiring harnesses and connectors before beginning any testing. Wiring circuits, electrical sensors, and/or connectors that have been contaminated with engine oil, coolant, or power steering fluid should be examined carefully for damage. Petroleum based fluids may break down the protective insulation on wiring and lead to shorted or open circuits and a stored P0368. This is also a great time to load test the battery, check battery terminal ends and cables, and alternator output. Now, connect the scanner to the vehicle diagnostic port and retrieve all stored trouble codes and freeze frame data (if available). I like to write this information down as it tends to help if the code proves to be intermittent. Some scanners also feature a DVOM and an oscilloscope with integrated test leads. If you can obtain this type of scanner, it will be your best bet for diagnosing this code. Proceed by testing voltage and ground signals at the camshaft sensor in question. Most OBD-II equipped vehicles utilize a five-volt reference as a base, but check manufacturer’s specifications for your vehicle. There should also be a ground signal. A third circuit (known as a signal circuit) supplies a signal to the PCM. There may also be other output signal wires but this is a basic overview. Again, check the wiring diagram (found on All Data DIY) for your vehicle. If the reference voltage and ground circuits are within manufacturer’s specifications, proceed to the next step. Disconnect the electrical connector from the camshaft sensor in question and test it following manufacturer’s recommendations, using the DVOM. If the resistance values of the sensor fail to comply with manufacturer’s specifications, replace the sensor. If all internal sensor circuit resistance values are in line with specs, proceed to the next step. Reconnect the camshaft sensor in question and attach the positive test lead of the oscilloscope to the signal output wire. Connect the negative lead to the sensor ground circuit. Turn the oscilloscope on and select the appropriate voltage setting. With the engine running, observe the waveform pattern on the oscilloscope. Look for unexpected spikes or glitches in the waveform pattern. If spikes or glitches are observed, carefully wiggle the wiring harness and connector for the sensor in question to try and determine whether the problem is a loose connection or a defective sensor. Also look for missing voltage blocks in the waveform pattern. If there are missing blocks, suspect a broken or worn reluctor wheel or cog. Also check the magnetic tip of the camshaft sensor for excessive metallic debris and clean it as necessary. If the waveform seems normal, proceed to the next step. Reconnect the test leads of the oscilloscope to the same circuits near the PCM connector. Observe the waveform pattern. If there are variations in the waveform pattern, as it was seen when the test leads were connected near the sensor, suspect an open or shorted circuit between the camshaft position sensor connector and the PCM connector. Disconnect the connectors from all related controllers and begin testing individual circuits with the DVOM. Shorted or open circuits must be replaced. If the waveform pattern appears as it did when the test leads were connected near the sensor, suspect a defective PCM or a programming error. This is not an exhaustive list of related codes. None found. Ask a question about P0368.